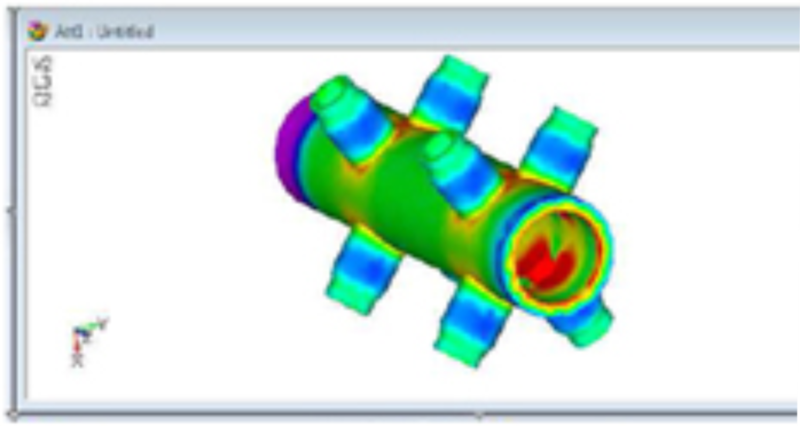 To simulate the stress distribution of four different configurations of attemptor bottles using Finite Element Analysis. This is done to verify the sustained and expansion stresses coming on them and to determine the maximum safety factor for which they can be used. Four different configurations of downcomer feeder bottles and two configurations of attmperator bottles are analyzed using Finite Elements Analysis(FEA) to verify the sustained and expansion stresses coming on them and to determine the maximum safety factor for which each of these configurations can be used. The bottles and nozzles were modelled as solids. Once the CAD model was created, these structural models were then discretized into small Finite Elements using tetrahedral solid elements. Appropriate loading conditions were applied on the nozzles after categorizing them into pressure, sustained and expansion load cases. This model was then analyzed using linear static analysis by applying appropriate material properties. From the FEA results it can be seen that the stresses on membrane are higher than the allowable values for both feeder bottles and attemptor bottles. Design modifications were suggested and implemented in a re-run of the analysis to reduce stresses. 6) Design of supports for pipelines. 7) Expansion Joints, Flexible joints calculations. 8) Weld and bolt Calculations.